Adidas Cricket Shoes have been re-launched in the brand new footwear range for 2018. An exciting new silver and grey colourway across all the boots including the new SL22 Boost shoes. All Rounder predict a huge year for the new shoes with record sales expected from one of the most attractive looking boots ever to be launched on player's feet across the UK. 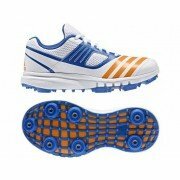 Comprising of great comfort, support and superb grip, whether you are batting or bowling the Adidas boots are built for you. EVA midsole brings comfort and shock absorption and the colours are simply dazzling. Their popular shoes have been redesigned with a striking blue and red trim. This equipment is some of the best on the market and are fully endorsed by most of the England Cricket Team and historically by Kevin Pietersen and Stuart Broad. Also England opening bowler, Jimmy Anderson. Adidas have always been known for their high quality and comfortable equipment and this new 2018 range is no different.